MISSISSAUGA, ON – On December 14, 2015, LiUNA Local 506 Worker’s Union generously sponsored Safe City Mississauga’s Neighbourhood Watch Program for 2016. The $2000.00 presented will assist Safe City Mississauga’s Neighbourhood Watch program in having the ability to monitor crime trends through GIS Spatial Analysis. “As a not for profit, charitable organization, Safe City Mississauga is always appreciative of corporate sponsorship and donations. Through sponsorship like that of LiUNA Local 506, Safe City Mississauga is able to ensure that crime prevention in Mississauga continues to be evidence based and impactful and ensures that Mississauga remains the safest largest city in Canada.” said Ashley Lyons, Executive Director of Safe City Mississauga. professional community leadership and guidance for crime prevention programs and activities; encourage crime prevention education within the public, private and voluntary sectors; and research, develop and implement new community crime prevention programs and activities. Put simply, we want to stop crime before it starts. 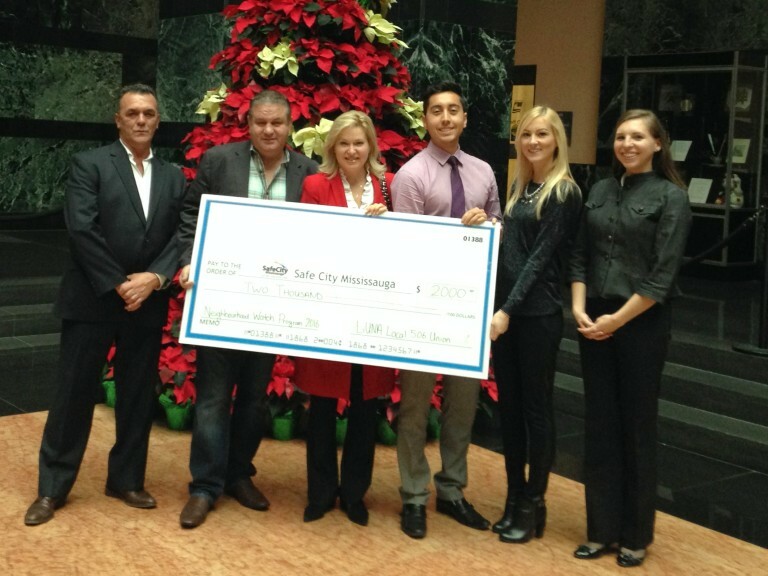 Pictured above, from left to right: Jack Eustaquio (Executive Board Member Local 506), Tony Do Vale (Secretary-Treasurer Local 506), Mayor Bonnie Crombie (City of Mississauga), Alex Papatchidis (Neighbourhood Watch Program Coordinator and Staff Criminologist), Ashley Lyons (Executive Director), and Nadia Mokriy (Community Services Manager).